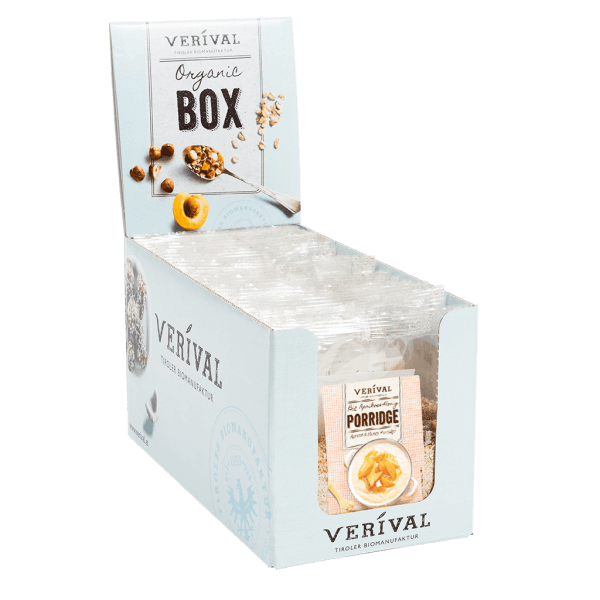 Warm oat cereal with fruity, sweet apricots, finished with a delicate apricot and honey granulate. Mixed to perfection by hand in the Austrian Tyrol. Deliciously fruity and 100 % organic. Good morning!Warm oat cereal with fruity, sweet apricots, finished with a delicate apricot and honey granulate. Mixed to perfection by hand in the Austrian Tyrol. Deliciously fruity and 100 % organic. Good morning!Warm oat cereal with fruity, sweet apricots, finished with a delicate apricot and honey granulate. Mixed to perfection by hand in the Austrian Tyrol. Deliciously fruity and 100 % organic. Good morning! Oat bran*, chopped apricots* 9% (apricots* 97%, rice flour*), honey granulate* 7,8% (raw cane sugar*, glucose syrup*, apple puree concentrate*, rice flour*, honey* 5%, oat fibre*, cocoa butter*, gelling agent: pectin*), apricot granulate* 7,8% (fruit* (apricot puree* 26,5%, apple puree concentrate*), raw cane sugar*, fructose syrup*, rice flour*, lemon juice concentrate*, cocoa butter*, gelling agent: pectin*; natural flavouring: apricot. Put 50g porridge (6 tbsp) in a bowl and pour over (depending on the consistency desired) 100ml boiling water or 80ml hot milk. Stir, leave to soak for 3 minutes and enjoy warm.